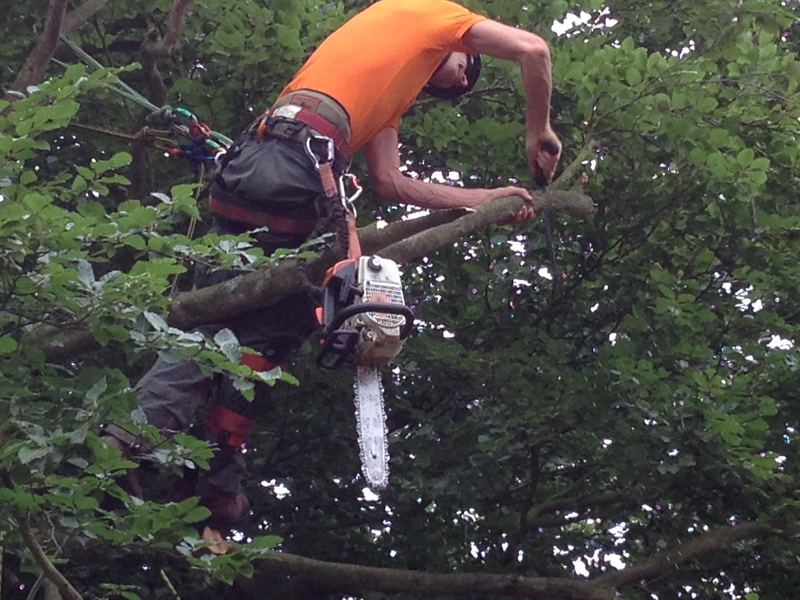 Today one of our tree teams have been carrying out some tree reduction work in Norwich Norfolk. The work was being carried out on behalf of a housing association, the job was to reduce the overall dimensions of a large Oak tree by four meters. The tree had a fruiting body of Ganoderma applanatum (artist’s fungus) so we recommended a light reduction to help relieve some stress on the main structure. The tree was located in a rear garden and the crown was over three different gardens so there was no access to use a MEWP ( Mobile Elevated Work Platform) so climbing was the only option. As with all large trees when safe to do so we use a four man team two climbers and two groundsman, each climber working in half the tree and each having a groundsman. With this job nearly everything had to be lowered down using rigging kit, this is set up in the tree and using pulleys and other devices, the branches can then be lowered smoothly and safely to the ground in a controlled manner. When we undertake large crown reductions we always cross cut and pile up the arisings rteday for chipping once the climber has decended for a break, this means the groundsman is always avadible to service the climber passing up equipment, lowering branches and keeping a watchful eye over proceedings making sure that the public don’t approach on the work site.